Here’s my only complaint with a three-day weekend: I wake up on Tuesday super confused as to what day it is and wonder why nothing got done on Monday. Then I go into full on panic mode in my head. This is when my type A side kicks in and starts reminding me that we’ve already lost a day this week and it’s GO time. Mind you this is all while I’m surfing Facebook and drinking my coffee for an extra 10 minutes than I usually do. I don’t always listen to that voice in my head. I should, but I don’t. I also don’t listen to the voice that says go back to bed. I really should start listening to myself more. Now onto the fact that I’m wearing a metallic tweed pencil skirt. That’s right — it’s metallic and shiny and gold and it’s called ‘sparkle tweed’. You better believe my eyes lit up the minute I saw this skirt. 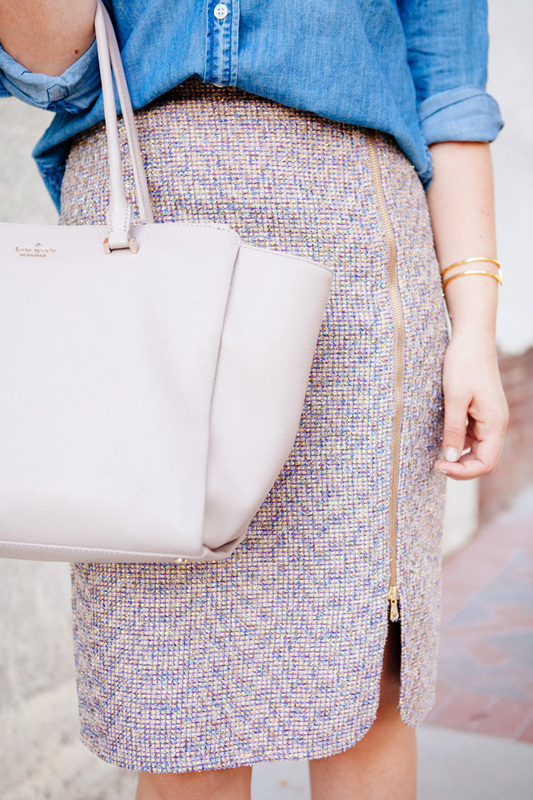 There are two things I will never not love: anything gold and pencil skirts. When you mix them together, it’s my kryptonite. Oh, look they made a jacket in this fabric, too. Just think if you wore them together, the possibilities of being the shiniest person at work are very, very good. Dying for the skirt. And I love pairing denim with other textiles. It looks good with everything! What more could you want than being the shiniest person at work eh? Instant promotion I reckon! 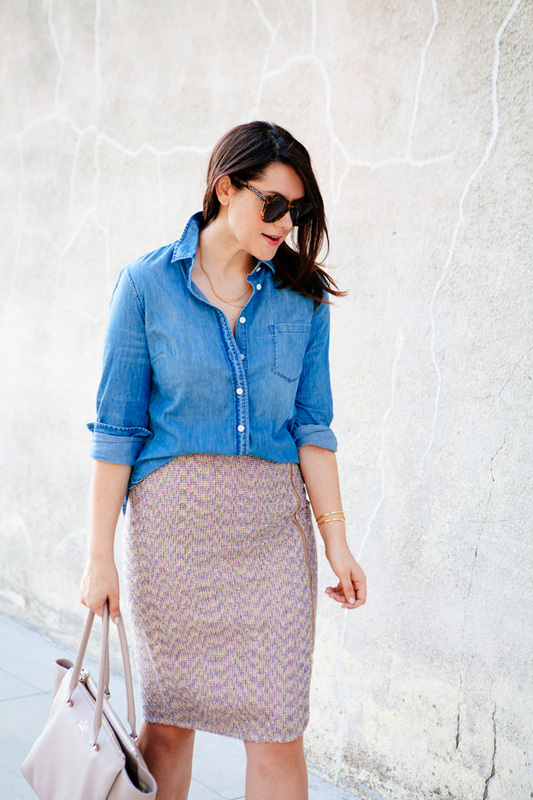 Love this skirt on you. I love the color of that purse! Did you get a regular size or petite? How tall are you? Regular! It’s a long skirt, for sure. I’m 5’9″ 🙂 Hope that helps! That skirt is incredible! 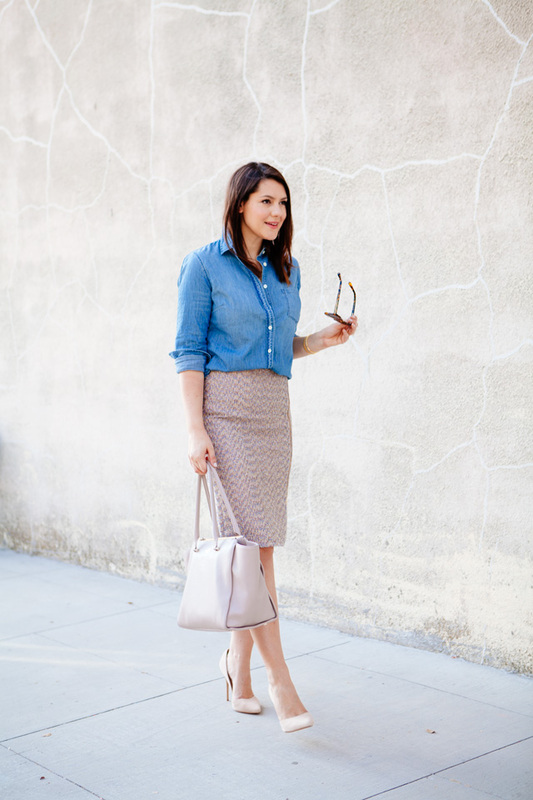 I do love tweed a lot, and it looks great paired with Chambray. That skirt is gorgeous! I need it in my life! Really fun skirt! Polished but still fun with the zipper and sparkle! This look is so perfect! Can’t wait to copy it soon at work! That zipper detail is the best part of the skirt, in my opinion! Love it! Fabulous look, as always! This skirt is really cool, love the zipper “detail”. Love the skirt! Great look. 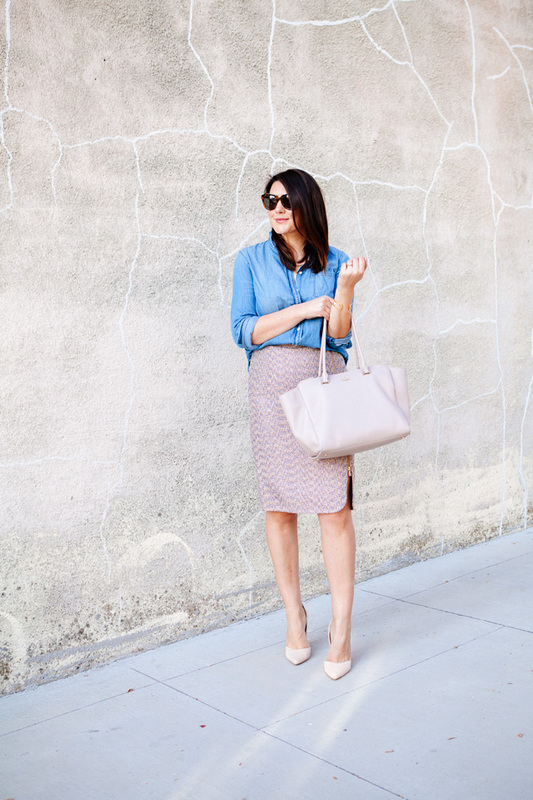 That tweed skirt is great. I love the zipper on the side. 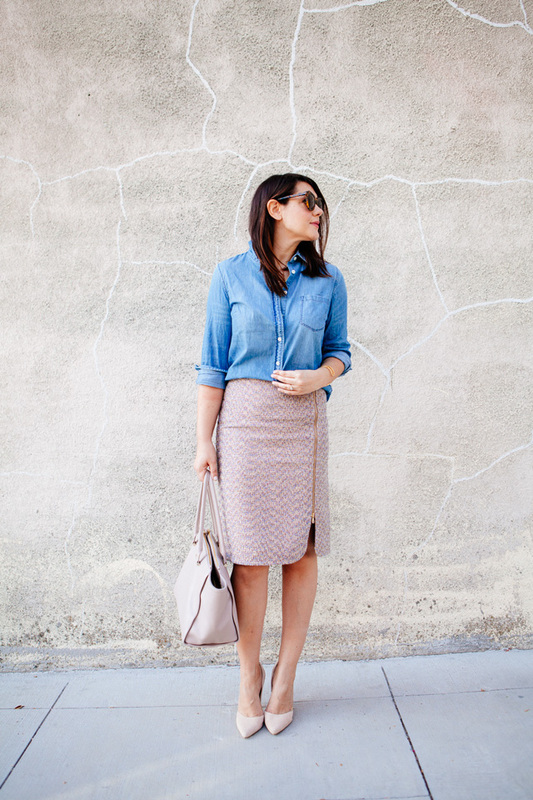 It looks great they way you styled it with the chambray shirt! 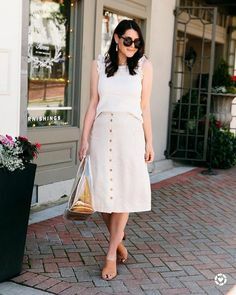 Such a unique skirt–love! You look so chic and modern. I love this skirt! The zipper detail is so cute! http://trendkeeper.me .. Perfect manicure & giveaway! 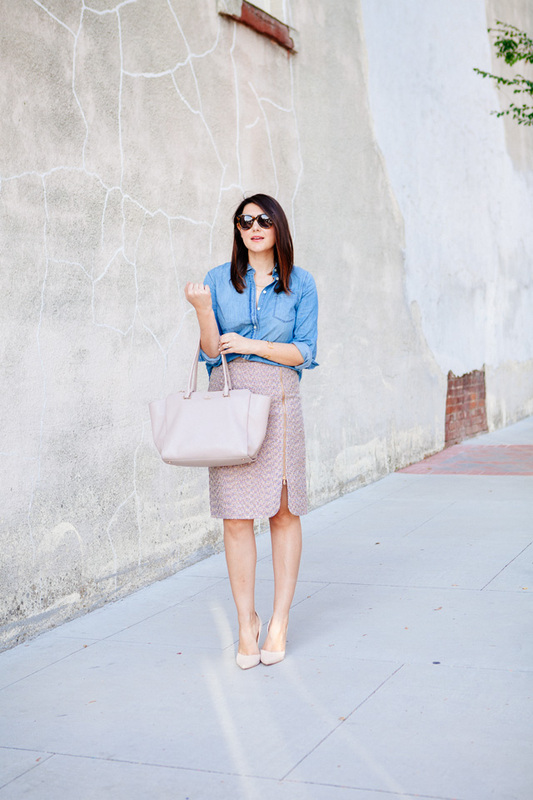 in love with your tweed skirt! I love the look. 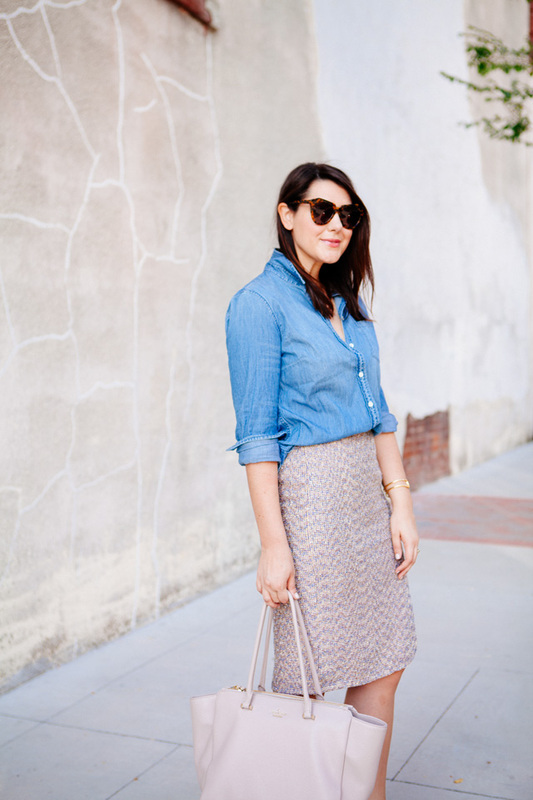 What is admirable is the way you have mixed denim with a lady like skirt. The result is awesome. LOVE this skirt! Such a pretty look on you. This is something I would absolutely love to be able to pull off, such a great look! Love that skirt!! It is so darn cute for fall!